When Haiyan Zhang was beaten with electric batons by jailers in a Beijing forced labor camp, he almost lost consciousness. There was only one thought on his mind during the ordeal, “I have not died yet. 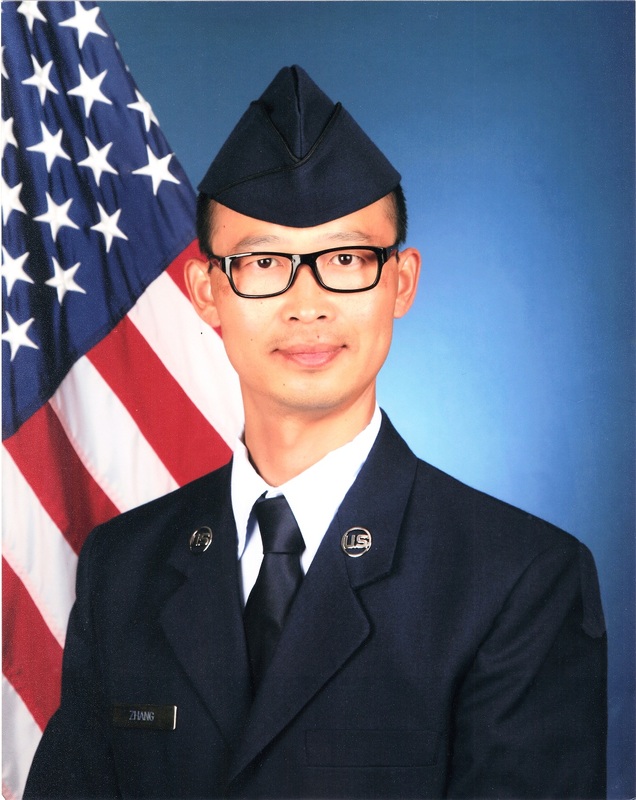 And I cannot die now.” While imprisoned, the last thing he was thinking about was seeking refuge in the United States, let alone someday joining the U.S. Air Force. Haiyan Zhang was thrown into a forced labor camp in Beijing in 2001 at the age of 20 because he refused to renounce his beliefs in a traditional Chinese meditation practice called Falun Dafa—which promotes truthfulness, compassion, and forbearance. Former Chinese Communist leader Jiang Zemin ordered “state apparatuses to eradicate Falun Gong in three months.” He, however, underestimated the strength of Falun Gong’s spiritual following. Since the persecution started, millions of practitioners have chosen to refuse renouncing their faith; knowingly risking harassment, arrest, and even death at the hands of the Chinese regime. According to Minghui.org, at least 4,135 Falun Gong practitioners are confirmed to have died at the hands of the government since the beginning the persecution. Reports from eyewitnesses and physicians in China reveal that thousands of Falun Gong practitioners have had their organs illegally harvested and sold for enormous profit in the black market organ trade. Because of the persecution, Zhang escaped to the United States in 2012. “I was granted asylum status by the United States government. Since then, I have enjoyed all the freedoms that the U.S. has to offer, so I always look for ways to give back to this country.” Zhang says. He joined the U.S. Air Force in 2016. Zhang did not feel the same pressures his wingmen did because he had lived through a much more brutal environment in the forced labor camp. He was tortured and abused, and even came close to death while being imprisoned back in China. Zhang admires and respects the American spirit of liberty. He recalls the United States Declaration of Independence clearly stating that life, liberty, and the pursuit of happiness are people’s unalienable rights. He believes that governments should be created to protect these rights. “I like the story about David and Goliath,” Zhang said, “but the battle is not over yet. The evil forces against humanity still exist on Earth.” After the collapse of the Soviet Union, Communist China became the No. 1 totalitarian regime in the world, while the United States is still the leader of free society. 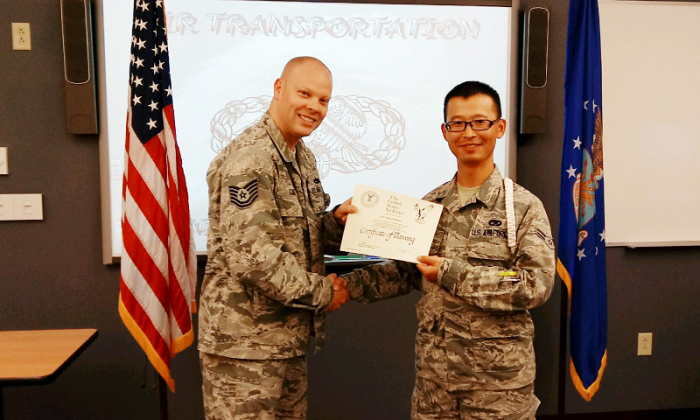 The U.S. Air Force’s core values, integrity first, service before self, and excellence in all we do, attracted Zhang to join. “They are similar to the principles taught by Falun Dafa, such as to be honest, to consider others first, to sacrifice and to bear our responsibilities,” Zhang says. Among the 52 students in his dorm, Zhang was the oldest. He had never gone to a gym before. He was thin, short, gentle, and frail-looking. However, he never gave up. He ran faster and faster, and went from yellow belt to blue belt. Finally, he passed the physical test with a 89.9 score. Although Zhang still has somewhat of a language barrier, he passed the End of Course test with a score of 92. During the technical training, Zhang was appointed to be the class leader. With a score of 96 on the End of Course test, he won the distinguished student award. 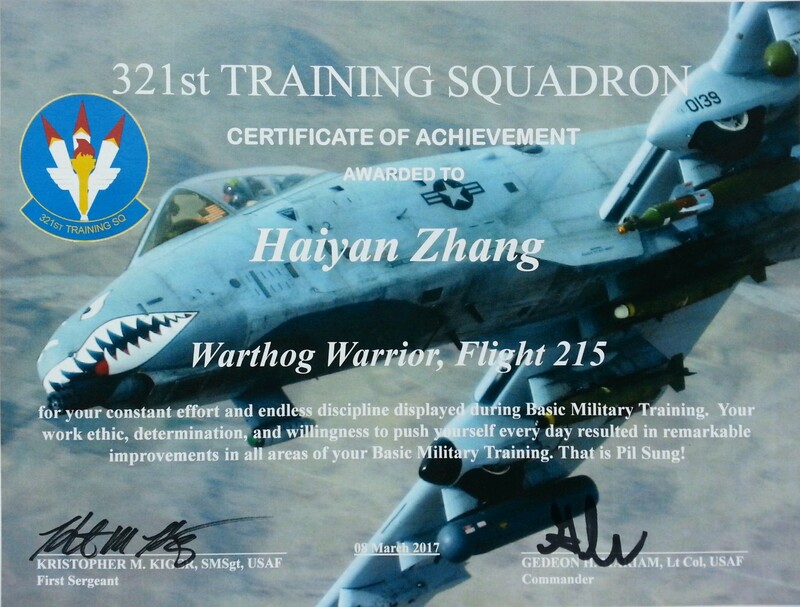 Now Zhang is an USAF Airman, but he sees this as just a start. To be a guardian of freedom and justice, he knows that he will have to keep practicing and growing every day. Hooah! Keep going. Fly, fight, and win!